I installed my Toyota Celica Trunk Lift Supports but they aren't holding the hatch open. 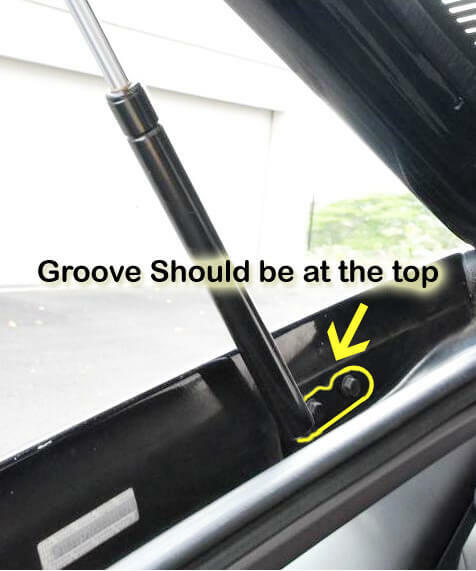 I have a 2000 - 2005 Toyota Celica, and I just replaced the trunk lift supports, however they won't hold up the trunk. This is a common question with the Toyota Celica, please look at the illustration to the left and ensure that the bracket is mounted correctly. When installing the support the bracket should be installed with the groove on top and the flat part of the bracket should be face the ground.